Pack Size: 36" x 12" x 12"
Wall Material: Polyester 190T 600mm P.U. Fly Material: Polyester 190T 1,200mm P.U. If you are planning a camping trip sometime in the near future, you'll want to take along this cabin style Carter Mountain Tent. 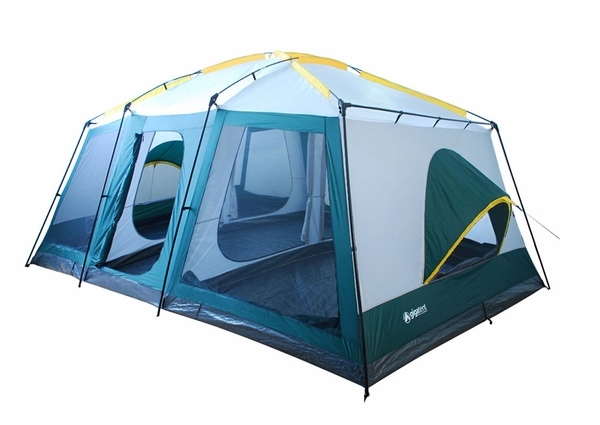 Designed with families in mind, this tent has three spacious rooms that comfortably seats 8-10 people. There is a common room that can be used for another bedroom or for storage and the tent is equipped with 2 oversized doors that allow convenient access. This tent also has an awning that protects from rain, and the full coverage rainfly has clear and light grey panels. This tent features a bathtub floor that prevents water seepage for the ultimate in dry camping! We?ve used this tent a few times. The first time was in our backyard and everything went great! Our only concern at that time was the noise from moving around. We?ll need to seal the seams on the tent to keep moisture out, but we didn?t have any that first night. We later tried it on an extended campout. We noticed we probably didn?t have the rainfly installed properly, because we had some moisture that puddled up after a rain. I don?t think it would have been there if we had the rainfly tied down all the way as the instructions show. We noticed the same problem with the noisy floor, but I don?t think that would have been a deal breaker for us if we knew about it before we bought the tent.